Do you know if your home uses gas? You need to know the answer to this question ASAP. Gas can potentially be explosive and harmful if the lines become damaged during a disaster – it’s critical you know how to turn off your home’s gas supply quickly and easily before it’s too late. Disasters that may require you to shut off your gas include anything that has the potential to damage gas lines. This includes earthquakes, bombings, hurricanes, tornadoes, and the likes. If you were out of the house during the disaster and smell gas inside the house when you return, do not attempt to enter the house to retrieve a gas shut off tool. Instead, call 9-1-1 or borrow a gas shut off tool from someone as emergency services will likely be overwhelmed. First, you need to identify if your house uses gas. Houses can use gas for heating, water heating, and cooking (stoves). If you think or know that your house has a device that uses gas, you should be aware of where your gas line is. For small situations, like a gas leak that occurs during a non-disaster situation, it may suffice to cut off the gas at the appliance that uses gas. Most gas-fed appliances have a local shut off valve that will cut off gas just to that appliance. During a disaster this will not suffice as you still risk the pipes in the house breaking. To completely shut off the gas to your house you need to find the gas meter. This is almost always located outside so that you are not trying to cut the gas off in a saturated environment. 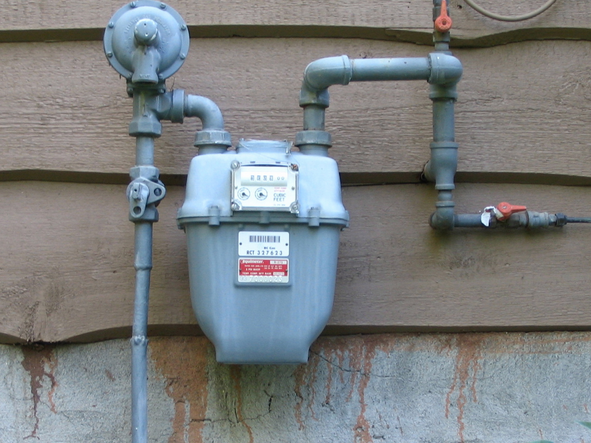 A gas meter itself will resemble a power meter, but it will have several pipes coming out of it. To shut off the gas you are looking for a pipe with a T-intersection in it. There will be a little lever that requires a wrench on one side of the T intersection. The easiest way to turn this little lever is with a gas shut off wrench. The gas wrench can be kept in your survival kit and is a flat piece of metal with holes on either end that resemble the shape of your gas cut off lever. The wrenches don’t need any adjusting and all you do is turn the gas connection. If for some reason you can’t access your gas shut off wrench, you can use a crescent wrench or similar tool. It just takes a little more work to properly adjust the size. When you shut off your gas you need to realize that it won’t instantly come back on. It is recommended that you never try to turn your gas back on yourself after a disaster. You won’t know if there are any breaches in the gas lines in your house. It may be a while before the gas company can return to turn the gas back on, so plan on having alternate methods of cooking and/or heating your water. It may sound like a pain, but cutting off your gas in the case of an emergency can save your life and the lives of those around you. Safe guard yourself today by ensuring you have a gas shut off wrench and know where your gas meter is. This entry was posted in Uncategorized on May 18, 2015 by David Adams.